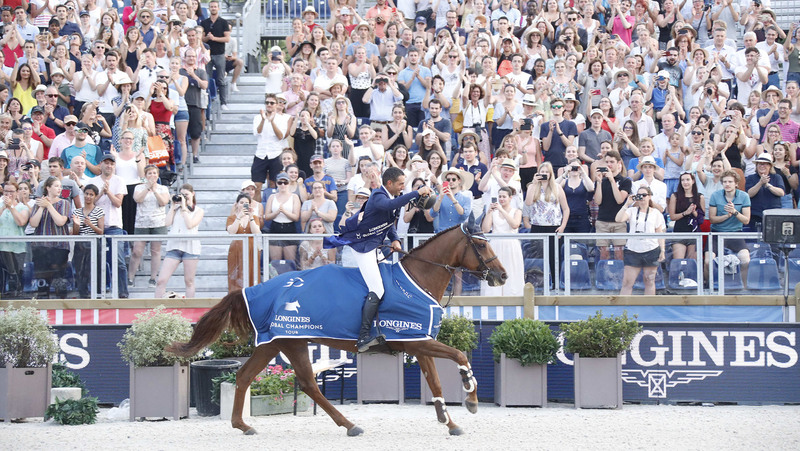 In emotional scenes as the sun set behind the Eiffel Tower, Sameh El Dahan (EGY) was given a standing ovation as he celebrated a breathtaking victory in the Longines Global Champions Tour Grand Prix of Paris. The young Egyptian and his plucky mare turned the tables on the heavyweights of show jumping triumphing against 10 world class riders in an electrifying jump off on the spectacular stage of the Champs de Mars; the Longines Global Champions Tour - Longines Paris Eiffel Jumping. The LGCT Grand Prix played out on one of the most iconic and dramatic stages for show jumping and the competition was as hot as the temperature. Stunning aerial images beamed around the world showed incredible views of the Eiffel Tower and the City of Lights as top sport got underway in the French capital. The 10th leg of the LGCT championship was a stunner with Sameh, who originally qualified as a doctor, taking top spot on the podium with Bertram Allen (IRL) in second and Harrie Smolders in third. The 1.60m LGCT Grand Prix was watched by passionate crowds who filled the grandstands along with international guests enjoying fine dining in the chic hospitality lounge. In the first round 35 starters faced a formidable technical course designed by Uliano Vezzani although the slightly generous time allowed took off some of the pressure. Bertram Allen and Molly Malone V clocked up the first clear round swiftly followed by Pieter Devos (BEL) and Claire Z - the jump off was on. There was huge disappointment for Leopold van Asten (NED) with VDL Groep Beauty and home hero Simon Delestre (FRA) and Hermes Ryan who both fell victim to the final oxer. But Frenchman Philippe Rozier (FRA) lifted French spirits as he pulled off a faultless round booking his place in the jump off. Gregory Wathelet (BEL) and MJT Nevados S and Marc Houtzager (NED) on Sterrehof’s Calimero both impressed with clear rounds. As the shadows lengthened Edwina Tops-Alexander and California began their campaign to stretch her ranking lead and raised their chances with a fast, buzzing clear. The course and the heat took their toll on world class talents including Beezie Madden (USA), Laura Kraut (USA), Christian Ahlmann (GER), Marcus Ehning (GER), Alberto Zorzi (ITA) and French riders Kevin Staut and Penelope Leprevost. Ben Maher, LGCT Overall Ranking Leader: "I will just be trying to do my best every week. It was a very good show this weekend with Explosion W. He is an incredible horse and jumped a lot of clear rounds, but I couldn’t keep up with these guys today. It was a great jump off. There is still a long way to go and I just try to do my best." Jan Tops, President Longines Global Champions Tour: "It has been an amazing event here in Paris, under the Eiffel Tower. We are already at the 10th event and we have great sport still to watch for the title. It is still not done yet, but you see the ones who are the contenders for the title. "It was a beautiful result in the Grand Prix to see Sameh who came in through the GCL and would otherwise never have had a chance to start in these events. It is fantastic to compete again the best riders in the world and then win the individual. "It is amazing now to also qualify for the LGCT Super Grand Prix. Now it is very close and next week (in Chantilly) you have a huge grass ring so we will see different horses and that is why GCT is so special, totally different circumstances jumping by day and night and in big and small rings so the winner is truly the best rider in the world. Harrie Smolders, Third Place: "To me the fences were really high and we must give a compliment to Sameh as it was probably one of the toughest Grand Prix to win and he’s deserved it, he was the best one today. My horse gave everything, he was superb, and this was the highest position we could get today." Bertram Allen, Second Place: "It was very hard to be first of 11 in the jump off but I just went in with the attitude to give it everything and I’m so delighted to see Molly jumping so well again. I thought it would be enough for the podium, but the line up in the jump off was unbelievable with Peder, Edwina, Ben, Sameh and Harrie so it wasn’t going to be easy to hang on. Sameh El Dahan, Winner: "To be honest Bertram’s round was very hard to beat. I said I think it is already done, but I have been riding my mare seven years so I dared her a bit too much to the double, I was really tight and she really helped me and that put me on the right side of the clock today. As I came into the warm up they said you won. It didn’t really sink in. It was one of the best wins of my life to be sat here with them today is already a big thing for me. "I have been with Sycamore Stables and the Sloan Allens for eight years through thick and thin but it paid off today. It was a big thing for us to come to Globals this year. I am over the moon with my horse the way she jumped today, to the second to the last jump it was like a race, she is a horse of a lifetime. "(Qualifying for the GC Playoffs) That was one of our aims and at least now we have done it and can focus on bringing the mare there in best form and competing with the best 16 riders in the world and hopefully we’ll pull out a great result there."